Need great quality printed envelopes in a hurry? Relax! Printing Envelopes have an amazing range of options plus bags of capacity to turn your job around in a flash. 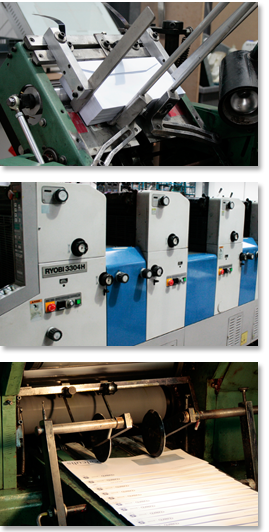 Our speciality Halm envelope press thumps out 40000 envelopes per hour and can even print on the flap in a single pass! Why not request a quote and see what great rates per thousand the Halm can offer on single and two colour envelopes from DL to C4. For eye popping full colour, we offer superb ink coverage on our four colour envelope press. Get your business mail noticed and stand out from the crowd! We've got some amazing samples which can help the conversion rate of your entire campaign. Pop in and take a look or call for pricing details 0845 362 0983. With 750,000 envelopes in stock at any time and an incredible ONE MILLION capability per day on printed envelopes, we are your perfect partner on envelope printing. All sizes, all colours, challenge your supplier to match our offering!